← 3D Printer Drumset? Cool! But, How Does It Sound? SKF NOTE: Herb Nolan’s 1977 Elvin Jones interview is loaded with wisdom and insight. Thank you, Down Beat, for making the entire interview available online. What Elvin says here about keeping time is among my favorites from Mr. Nolan’s piece. 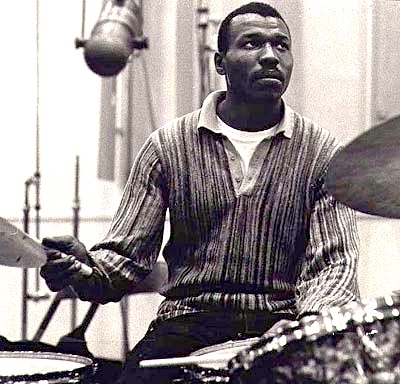 Elvin Jones: “Time doesn’t change. I mean, there is nothing new about timekeeping…., some people can keep better time than others. Some people are more sensitive to rhythmic pulses, and the more sensitive you are, the more you can utilize the subtleties of timekeeping. “For instance, when I am playing I can use the bass drum beater at a minimum because [the bass drum’s] not necessary for me to sustain the pulse. I can get just as much of a dynamic thrust with the hi-hat or a light touch on the ride cymbal and balancing the natural pulsation of, say, 4/4 or 3/4 time throughout the different components of the drum set. “It’s just as effective for keeping the same pulse going as…using one component—but it’s not conventional. The conventional thing is to use the hi-hat for the after beat and use the bass drum for the underlying 4/4 or 3/4 rhythm to keep the steady pulsation … I just think you have to use all of the drum set all of the time. Of course, …the character of the composition…dictates how you are going to use the set’s components. This entry was posted in SKF Blog and tagged Down Beat, Drummer, Elvin Jones, Herb Nolan, Scott K Fish. Bookmark the permalink.